I am not a killer. I just fell in love with the wrong man. I went too far this time, and there’s no going back. There’s no going anywhere, period. I nearly stayed afloat, but my luck ran out. Luck, that mystical mythical glue that holds the shards of despair together and makes life navigable. But fragmented despair, that’s what sinks you.It’s the middle of the day and the ghost of a cat walks across my bed. I am hidden in the downy softness of bleach-laundered sheets, sheets ironed with starch and cleansed of their filthy sins by scalding Catholic water.The bed is high and wide and the pillows are like clouds ripped from a summer’s sky. I bury my head in cotton balls, puffy meringues and whipped cream, and try to ignore the ghost of the cat that is walking the length of my back.The cat settles at my feet but it gets up again and pads along my legs. When it first started its prowl, I sat up and reached for it but, like all ghosts, it immediately vanished and waited for me to turn away before settling in a warm, heavy lump against my side. Its weight is comforting in a way, like being massaged by the hand of God, but it isn’t God. It can’t be,because God, like luck, has left the building of my life. ***Excerpt from Rotten Peaches by Lisa de Nikolits. Copyright © 2018 by Lisa de Nikolits. Reproduced with permission from Lisa de Nikolits. All rights reserved. In addition to Lisa’s amazing new thriller, she’s also released a new cookbook. 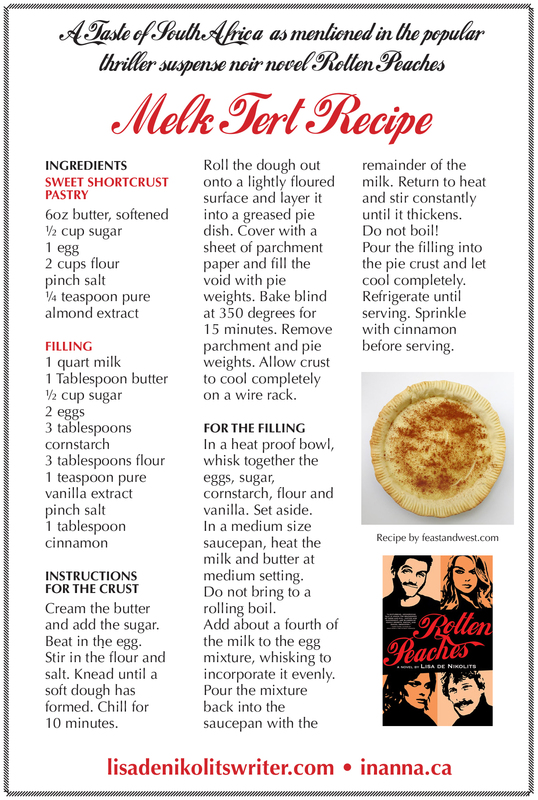 To celebrate she’s sharing the recipe for one of the South African desserts mentioned in Rotten Peaches!Download your copy today & start baking your way to a nourished body and spirit! Originally from South Africa, Lisa de Nikolits has lived in Canada since 2000. She has a Bachelor of Arts in English Literature and Philosophy and has lived in the U.S.A., Australia and Britain. Her seventh novel, No Fury Like That will be published in Italian, under the title Una furia dell’altro mondo, in 2019. Previous works include The Hungry Mirror, West of Wawa, A Glittering Chaos, Witchdoctor’s Bones; Between The Cracks She Fell and The Nearly Girl. Lisa lives and writes in Toronto and her very new book, Rotten Peaches is hot off the press to reader and literary acclaim. Lisa a member of the Sisters in Crime, Toronto Chapter, Sisters in Crime, Mesdames of Mayhem, The International Thriller Writers. Catch Up With Lisa On: lisadenikolitswriter.com, Goodreads, Twitter, & Facebook! Thank you very much for having me as a guest today! I really hope readers will try the Melk Tert recipe – I can vouch for it! However, I do admit that I bought pie crust and made the filling! I hope you will enjoy! I have this one in my pile and can’t wait to start reading it.